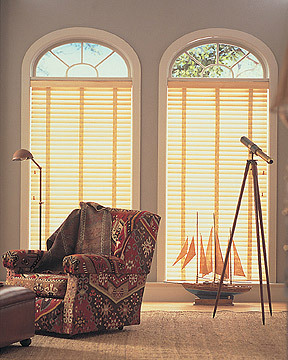 Silhouette® window shadings uniquely combine the functions of shade and blind. They permit an unobstructed view when open, yet safeguard privacy when closed. 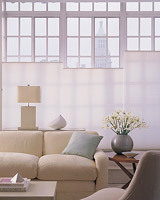 Luminette® Privacy Sheers combine the softness of sheer curtains with the flexibility of blinds. 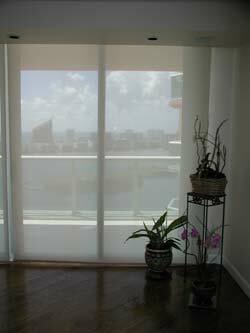 The sheers can be opened to welcome in the sunlight or closed for diffused light. The vertical vanes can be tilted partially or completely closed for greater privacy. 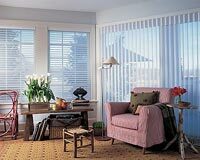 Counterparts® is an innovative way to combine Silhouette® window shadings and Luminette Privacy Sheers®. Together they bring a coordinated feeling and an even quality of light to a room with windows of different shapes and sizes. The Duette® Collection is the premier honeycomb collection featuring elegant fabrics, sleek low-profile hardware and TruePleat™ design which guarantees that pleats will remain crisp and even. View-ShadesTM, also known as Visually Transparent Shading, Solar shades, Sheerweave shades and Scrim shades, is a very contemporary product that gives you protection from the ultraviolet rays of the sun and still allows you to see outside. These ultraviolet rays can fade your upholstery and rugs in addition to artwork and furniture. At the same time as the fabric is blocking out the ultraviolet rays, it is also rejecting much of the heat that comes through your windows. This makes you more comfortable and lowers your electric bill. 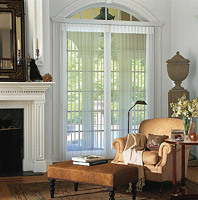 Vignette® window shadings combine the classic look of a custom drapery with the ease of a shade. 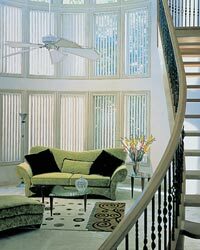 And, unlike other soft shades, Vignette window shadings are uniquely woven to hold their shape and style indefinitely and will not flatten, wrinkle, or sag. 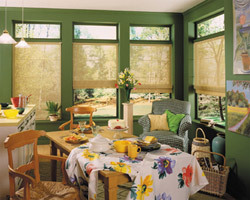 Country Woods® blinds have been designed in the tradition of fine furniture. 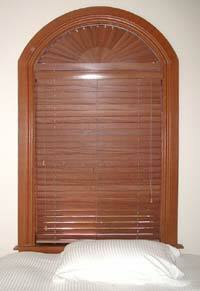 A collection of precision crafted, custom designed wood blinds that do more than complement the surrounding decor. They actually enhance it, refining the beauty of any room while giving your home a feeling of warmth and sophistication. 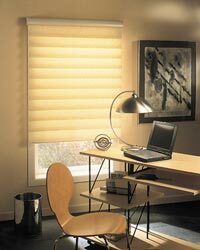 You'll find these beautiful 2" Basswood blinds exclusively from Aaron's Blinds. 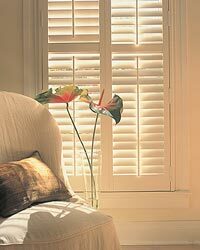 Palm Beach™ custom shutters combine the best of both worlds: attractive good looks and low maintenance. 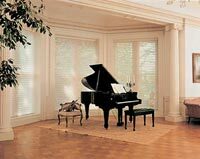 You can enjoy the stylish appearance of shutters in any interior space without worrying about warping, fading, chipping, or excessive wear. Provenance™ Woven Wood Shades bring nature indoors. With carefully selected bamboos, reeds, grasses and jutes, Hunter Douglas combines nature with technology, and the outcome is casual elegance. 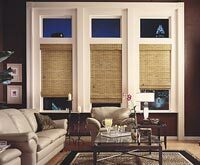 There’s no other window treatment that makes a statement quite like the Roman shade. Graceful and luxurious, yet wonderfully functional, it’s an asset to almost any room. 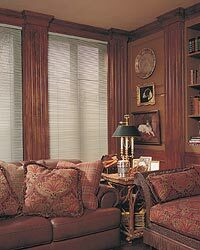 We expanded on the basic concept, and the Jubilance® Roman shade was born. When it comes to aluminum horizontal blinds, more people come to Hunter Douglas because they offer so much more - quality, reliability, and performance. And, more selection - from micro to mini to macro, in exciting new colors, textures and styles, and shapes to fit any window. Hunter Douglas vertical blinds combine beauty, easy maintenance and excellent light control with a rich variety of textures, colors and patterns. They're perfect for French doors, patio doors, bay windows, room dividers, large walls...anywhere in your home. 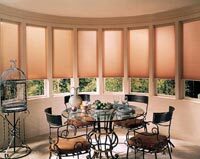 Blinds and shades equipped with our unique PowerRise® technology have everything needed for motorized operation concealed inside their headrails. And a streamlined remote control is all that's required to put the shade in motion.